The Tucson MSA is comprised entirely of Pima County located in southern Arizona sixty miles north of the United States-Mexico border. 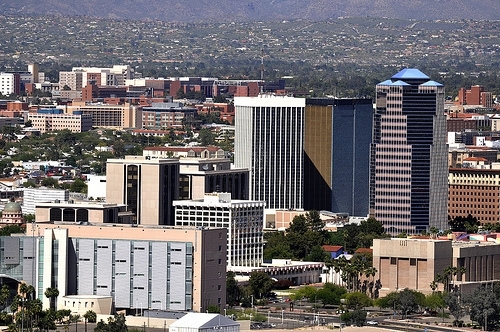 The greater Tucson area has seen consistently large growth ever since the early 20th century. Since the turn of the Millennium, the area has grown by over sixteen percent, and by approximately two percent in the last five years. One of the primary reasons for this is the city's proximity to the border of Mexico, and the flow of immigrants coming from Mexico and South American countries. These growth trends are expected to continue on into the future as immigrants not only from Central America, but from countries around the world continue to settle in the greater Tucson area. It is the second largest metropolitan area in the state of Arizona. Over a quarter of the population speaks a language other than English at home. Approximately 25,000 households in Tucson are linguistically isolated, which means that no adult has the ability to speak fluent English. The greater Tucson area has the seventh largest Native American community, as well as the fourth largest Navajo population in the country. The Asian population has seen over a fifty percent increase in size since the year 2000. Over 70,000 refugees have been resettled in the greater Tucson area since 1980. Over two-thirds of Tucson's foreign-born population are Hispanic, and Hispanics make up around forty percent of the total population of the city and the surrounding areas. Mexicans comprise the largest people group at over 75,000 people. Throughout its history, the city has been heavily influenced by Latino culture, and that is evident today. There are Hispanic neighborhoods located throughout the area, and approximately twenty percent of the population speak Spanish at home. Tucson also has a large refugee population, primarily from African and southeastern Asian countries. Very few of these refugees have been properly assimilated into American culture, and there are small communities located throughout the city. Iskashitaa- Isakashitaa means “working cooperatively together” and it is an organization that seeks to give aid to refugees from around the world that are relocated to Tucson, AZ.